The Murphys were often thought of as wealthy patrons of the arts and counted among their friends Picasso, Dos Passos, Hemingway, Cole Porter and the Fitzgeralds. Their life inspired numerous works of art by those lucky few who ran in that circle between the wars. The Murphys are also widely credited for popularizing (for better or worse) the French Riviera as a summer resort destination. 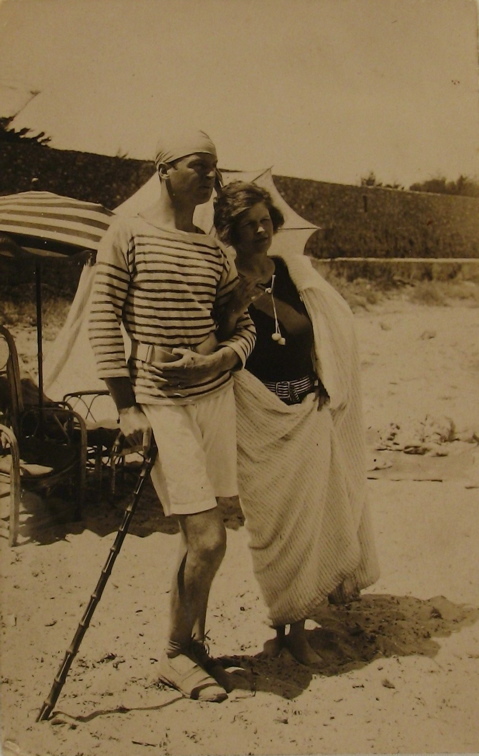 While we were living in St. Raphael, the Inimitable Mrs. E and I picnic’ed on the same beach (La Garoupe) where Gerald Murphy first cleared seaweed and rolled out the Oriental rugs and umbrellas to enjoy the sun. In the front of my journal I pasted a color reproduction clipped from The Washington Post of Gerald Murphy’s painting “Cocktail.” I had no idea of the enduring legacy that they had left behind them, nor of the impact that their story would have on me. A new exhibit dedicated to the Murphys and their influence (the first of its kind, I believe) is being unveiled at Williams College, July 8 – November 11. It will also travel to Yale University and to Dallas Museum of Art. If you can get to any of the shows, do. I can’t do their story justice. In my mind, they glow. The life that the Murphys built for themselves, despite a number of tragic events, continues to inspire me. I hope it does you, too. This entry was posted in Cultivating, Elegantology, Living and tagged books, Cultivating, Elegantology, Living, Murphy's, travel. Bookmark the permalink. Incredible! It’s interesting that you post about this. I recall reading often about the Murphys during my youthful Hemingway phase in the 1980s, but I had no idea of their importance or their longevity as a literary or artistic topic. Very interesting. “The art of living well,” indeed. We are looking forward to attending the show at Yale during Mrs. E’s spring break. A quick five hours or so to New York for a stopover and back on the train for New Haven. I’m tempted to take “Everybody Was So Young” or “Living Well is the Best Revenge” along for the ride. Really incredible tales of lives lived in full. I encourage you to read either or both of the books as I believe that they will have a dramatic impact.